The Sarala Temple is a Hindu temple in the district of Jagatsinghpur, Odisha, India. The temple is accessible by road from Jagatsinghpur, Cuttack and Paradeep. The nearest airport is Bhubaneshwar, which is approximately 80 km, and is well connected by road. The nearest railway station is Cuttack; however, there is a small Passenger Halt at Sarala Road, near Tentulipada. The temple can be reached via Jagatsinghpur, or Tarapur by road, from Cuttack. Maa Saarala is a Hindu goddess who patronizes the cultures of Vaishnav and Shakta. Rarely does one find the use of Vilva Patra and Tulasi patra in any temple, as they are symbols of two distinct divisions of Hindu culture. There is also some controversy regarding the deity, where it is suspected that the deity may be a Buddhist tantric figure, as she holds a book, Veena and hand bell – known Mahayana symbols. It is said that Huen Tsang, the Chinese pilgrim, visited Orissa and he had taken a ship from Chilitolo Port to Sri Lanka, which historians attribute to modern day Tirtol. This may be a possibility as geography shows that Paradip was an island and the land in and around Kujanga was under water – Sea/River. There is geographic evidence to support this. To be at a safer side, we may conclude that Sarala represents the Shiva-Shakti cult which evolved from an amalgamation of Shaivism (worship of Shiva), Shaktism (worship of the Mother Goddess) and/or Tantric form. Goddess Sarala is known as Vak Devi, the Goddess of Knowledge and Wisdom. It is well documented that Sidheshwar Parida – a small time farmer and part-time Oriya Paika – was an ardent follower of the Goddess and it was after her blessings that Sidheshwar Parida became Sarala Das, the author of the Oriya Mahabharata. Folklore goes back to thousands of years, to the age of Parashurama. It is said that it was God Parashurama who had carved the goddess with the tip of his arrow. Even this temple survived the ravages of Kala Chand (legendary Kala Pahada). The new temple- 500 years old – was built by the Raja of Manijanga. The remnants of the old temple is not visible, but folklore goes that it was at Badasarol, a place where the Ganesha Temple, (generally adorns the south gate of all Oriya temples) (Nanda Deula, now renovated) stands as witness, where the old temple once stood. Although there are many festivals that are celebrated in the temple, the major ones are: Parbana, Sharadiya Utsav, Pana Sankranti, Dola Purnima, Chandan Jatra. The people of the Kendrapara, Jagatsinghpur and Cuttack districts are so attached to the goddess that they make it a point to visit the temple every year – at least once. This shrine of Goddess Sarala of Jhankada is one of the most spiritually elevated expression of Shaktism from time immemorial. The heavenly abode of the Goddess is existent in the village of Sarala (Kanakapur) of the Jagatsinghpur district, located on the eastern coast of India. It is believed that Goddess Sarala is a synthesis of divine figure of Durga and Matangi. Three idols of Goddess are there in the sanctum sanctorum of the main temple. The main idol, carved out of stone is of eight-armed keeping right feet on the lion in Mahisha Mardini posture. As per the main priest (Puja Panda), the dhruva/main idol of Goddess is stationary (Achalanti Mula Vigraha) and she holds Sword (Khadga), Trident (Trishul), Manuscript (Pustak) and Lute or Veena in her right hands and Disk (pattisha), Bow (Karmuka), Bell (Ghanta) and the head of Buffalo Demon (Mahishasura) left hands. Some scholars associate Devi as Matangi mahavidya. The second idol of Maa is four-armed, holding Shankha, Chakra, Varada and abhaya mudra, and the third idol is two-armed, made out of eight precious metals (Ashtadhatu). These idols of Maa are taken out of temple in different ceremonial occasions and known as movable idols (Chalanti Bigraha). The Goddess otherwise known as Jhankad Vaasini Sharada or ‘Maa Sarola’ is worshiped in most of the houses of the local districts as well as in the state. The Culture of the deity result of the amalgamation of three principal Hindu cults Vedic, Tantrik and Vaishnavite. This place is one among the eight most famous Shakta shrines of Orissa. As per historical evidences, it is believed that this famous temple of Sarala Chandiwas constructed in Sarola Grama during the Bhauma Dynansty in 8th Century. The Goddess “Maa Sarala” was being worshiped in this temple till the end of Hindu rule in 1568 A.D. History, tradition, legend and literature remained as the silent witness to the existence of Sarola Chandi in the Sarola grama (village). In this context one among the great verses of Oriya Mahabharat may be quoted here. As per history, Tantrik Shakti worshiping was started from 7th. Century onwards in which it is believed that mother goddess is the source of power (Shakti) and highest spiritual bliss. Shaktism, in which power of mother goddess (Matrushakti) is depicted as the ultimate form of power, continued to dominate Buddhism, Shaivisim and Bramhinism after 7th. Century. During this period mother energy was conceived and expected in various ways and the image of Siva accompanied by his consort is conceived as Ardhanariswara (half male half female). During the early Bhaumakar rule 736 A.D the eight armed Mahinsamardini Durga appeared in the sculptural masterpieces of Orissa. Some eight armed Mahinsamardini idol (Bigraha) seen in some other part of Orissa in the eighth century had resemblance with Goddess Sarala. As per the eminent archaeologists and scholars the period of origin of the Goddess Sarala in Jhankad was during 8th. Century A.D.
By Road: The temple is well connected with roads network and is accessible by road from Jagatsinghpur, Cuttack and Paradeep. At least three buses are plying everyday from Cuttack (Badambadi bus stand) to Sarala peetha. One can avail bus facility from Cuttack or Paradeep in every fifteen minutes and can get down at Sarala Road stoppage to visit Sarala Temple. The Temple is only 10 minutes away from the bus stoppage by Auto rickshaw. The temple is only 20 minutes away on road from Jagatsinghpur district head quarters by a cab. The temple can also be reached via Jagatsinghpur, or Tarapur by road, from Cuttack. By Railway: The nearest railway station is Cuttack, however there is a small Pessenger Halt at Sarala Road, near Tentulipada. Two trains are plying daily between Cuttack and Paradeep and one can avail this facility to visit Sarala Temple. One has to get down at Sarala Road railway station and can get auto rickshaws to reach the temple, which is 3 kilometers away from the station. By Air: The nearest airport is Bhubaneshwar, which is approximately 80 km, and is well connected by road. There is a Bungalow of Roads and Building (R&B) department, Govt. of Orissa where one can stay overnight. The bookings for this can be done at the office of the Asst. Engineer, R&B, Tirtol. A Rest house of Water Resources dept., Govt. of Orissa is located near the temple. This can be used for overnight accommodation purpose and the bookings for this can be done at the office of Asst. Engineer, Drainage Division, Water Resources Department. Maha Visuba Sankranti: Some ritual performed at the place amalgamation of different influential cult adapted in the temple over a period of time. Various Tantrik rites are still being observed today at the place. Maha Visuba Pana Sankranti (Jhamu Yatra), otherwise known as “fire walking festival” is one of the important festivals of the Goddess. Sudra Sevaks belong to Roul caste on this occasion wear a picturesque custumes and dance bare footed over burning charcoals. Some ritual gestures are subsequently go round the nearby villages for nearly one month in order to campaign and spread magnanimity of Devi mahima. It appears that, this festival is a tantrik origin. Durga Puja: In the Autumn season, the Durga Puja is observed from Mulastami to Mahastami and is considered as one of the greatest festival in the Devi Peetha. Mahinsa Mardini Besa, Suna Besa and Kalika Nrutya are the main attractions of the festival. Sodasa Upachara puja takes place twice daily during this period. Traditionally the animal sacrifice of a buffalo is done on the prescribed day Mahastami (Sandhipuja), a male goat sacrifice is done before the ceremonial idol of the Goddess on the day of Dussehra at the old shrine of the deity Sarola Grama. Chandan Yatra: Chandan Yatra begins from Akshaya Tritiya and is observed for twenty-one days. 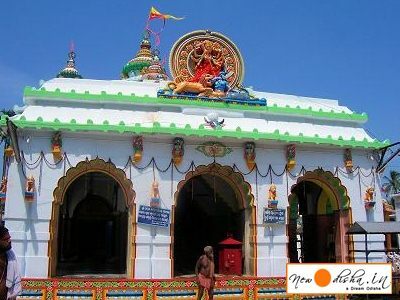 It is a unique festival of Shakta Shrine as deity is worshiped here as Parama Vaishnavi. In the text of Oriya Mahabharata Sarala Thakurani is described as Parama Vaishnavi. It is an old traditional festival from time immemorial. Nabanna Puja: The Nabanna in consonance with Orissa’s harvesting season is observed here in the first week of Margasirsha with a great devotion and is also considered as an important festival. Different types of foods are prepared for the deity, from the newly harvested crops and offered to the deity through Sodasa Upachara Puja and all the niyogies of the deity eat the Prasad in a group. As Jhankad was under the direct administration of Gajapati, influence of Jagannath culture and Vasihnavism are seen in this Devi peetha. This is quite evident from some of the rituals like Gamha Avisek, Pausyabhiseka in the full moon day of the month Sraban, Pausa, on account of Nabanka Bedha, the processional idol of God taken nine times round the temple similar to Sri Jaganath Temple Puri. Rasa Utsav in the month Kartik, Dola Melana in the month of Phalgun. In accordance with Jagannath culture Suniya in the month of Bhadrav is observed as coronation ceremony of Gajapati kings the resembling the rites in the temple of lord, Sarala the consorts is ornated in gracious ornaments. Give Responses for "Sarala Temple of Jhankad, Jagatsinghpur"